If you are in the process of preparing your manuscript for publishing, having your manuscript professionally copyedited and proofread is a must. Many times authors take this process too lightly and the outcome is not favorable. Poor editing can affect book reviews, book sales and even the chances of being accepted by a publisher. 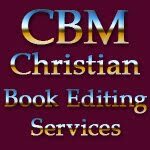 Let CBM's Christian Book Editing services help you fine tune your work and have the peace of mind knowing that everything is ready for print and distribution. ~Ambiguous, imprecise and improper words that could confuse your readers. ~Jargon and other terminology easily understood. ~Overuse of clichés and inappropriate language uses. ~Variety of sentence length and style. ~Use of active and passive constructions. ~Correcting grammar, word usage, capitalization, word breaks, tones, and format. Contact CBM's Christian Book Editing services for information and price quotes or email kingdomexpansion1@gmail.com.